Diego Rivera (1886–1957) was born in Guanajuato City to a well-to-do family. From the age of ten, he studied art at the Academy of San Carlos in Mexico City. In 1907 he moved to Paris, France to continue his studies. Influenced by Modernism, especially the paintings of Paul Cezanne, Rivera developed his own style of simple forms and large patches of vivid colors. His paintings began to attract attention, and he was able to display them at several exhibitions. 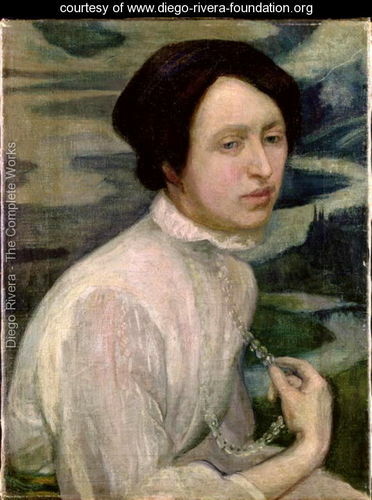 Rivera returned to Mexico in 1921 to become involved in the government sponsored mural program. He participated in the founding of the Revolutionary Union of Technical Workers, Painters and Sculptors, and he joined the Mexican Communist Party, becoming a member of its Central Committee. His murals dealt with Mexican society and reflected the country’s 1910 Revolution. In these murals, Rivera continued to develop his own native style based on large, simplified figures and bold colors showing folk, Mayan, and Aztec influences. His art, in a fashion similar to the steles of the Maya, tells stories, particularly narratives about the struggles of Mexican peasants and workers against the ruling class. Rivera’s radical political beliefs, his attacks on the church and clergy, as well as his flirtations with Trotskyists and left-wing assassins made him a controversial figure even in communist circles. Some of Rivera’s most famous and controversial murals are featured at the National School of Agriculture at Chapingo near Texcoco (1925-27), in the Cortes Palace in Cuernavaca (1929-30), and the National Palace in Mexico City (1929-30, 1935). In the autumn of 1927, Rivera arrived in Moscow, accepting an invitation to take part in the celebration of the 10th anniversary of the October Revolution. Subsequently, he was to paint a mural for the Red Army Club in Moscow, but in 1928 he was ordered to leave the country by the authorities because of involvement in anti-Soviet politics, and he returned to Mexico. 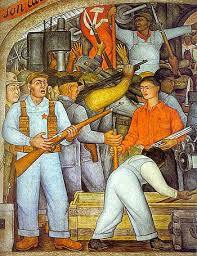 In 1929, Rivera was expelled from the Mexican Communist Party because his 1928 mural En el Arsenal was interpreted by some as evidence of Rivera’s prior knowledge of the murder of Julio Antonio Mella. After divorcing Guadalupe Marin, Rivera married the painter Frida Kahlo in August 1929. 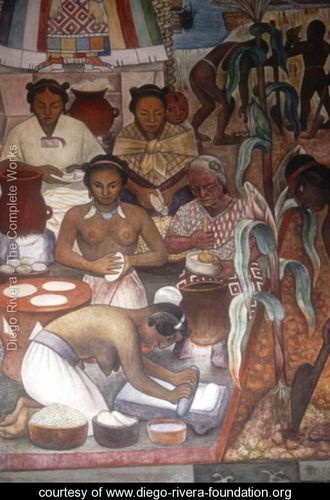 Also in 1929, the first English-language book on Rivera, American journalist Ernestine Evans’s The Frescoes of Diego Rivera, was published in New York. In December, Rivera accepted a commission to paint murals in the Palace of Cortez in Cuernavaca from the American Ambassador to Mexico. His mural Man at the Crossroads, begun in 1933 for the Rockefeller Center in New York City, was removed after a furor erupted in the press over a portrait of Vladimir Lenin it contained. As a result of the negative publicity, a further commission was cancelled to paint a mural for an exhibition at the Chicago World’s Fair. In December 1933, Rivera returned to Mexico, and he repainted Man at the Crossroads in 1934 in the Palacio de Bellas Artes in Mexico City. This surviving version was called Man, Controller of the Universe. On June 5, 1940 Rivera returned for the last time to the United States to paint a ten-panel mural for the Golden Gate International Exposition in San Francisco. Pan American Unity was unveiled November 29, 1940. Currently, the mural and its archives reside at City College of San Francisco. Considered the greatest Mexican painter of the twentieth century, Rivera is credited with imaginatively blending the bold narrative style of Mexican folk art with themes of social realism, as well as introducing fresco painting into modern art and architecture. His inspiring portrayals of workers and peasants continue to create controversy, and his womanizing and tempestuous marriage to Frida Kahlo, whose lovers included Leon Trotsky, remain a source of rich historical gossip. In a series of visits to the United States in the 1930s, Rivera brought his unique vision to public spaces and galleries which continue to enlighten and inspire artists and laymen alike. 1. 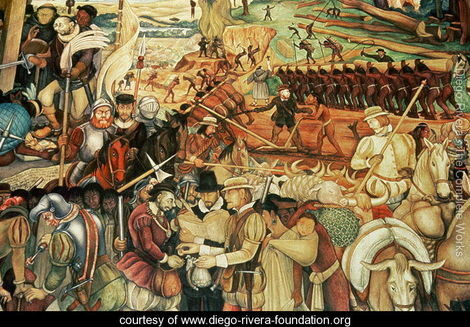 The Diego Rivera Foundation. 2. Ferrante-Fernandes, Laura. 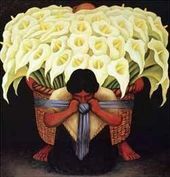 Art and Times of Diego Rivera. 3. Public Broadcasting System: American Masters. This entry was posted on August 9, 2015 by Vox Populi in Art and Cinema, Note from the Editor, Opinion Leaders, Social Justice and tagged Diego Rivera, Frida Kahlo, Mexican art, murals, Opinion Leaders, Social Justice, social realism, The Radical Art of Diego Rivera.